Gum disease, tooth decay, or oral injury can cause the loss of teeth, which, in turn, interferes with many of the daily tasks we take for granted. Once teeth are gone, a person has trouble eating, speaking, and smiling confidently. Modern replacement teeth look and feel natural, so you can reclaim your solid, attractive smile. Dr. Gunnin offers full and partial dentures made with lifelike materials for comfort and beauty. Dentures replace all teeth on the top or bottom arch. A partial denture replaces multiple missing teeth, but they do not have to be adjacent to one another. Both full and partial dentures are made with porcelain replacement teeth attached to a gum-colored base. Flexible partials work well for patients who cannot find comfort with traditional partials. 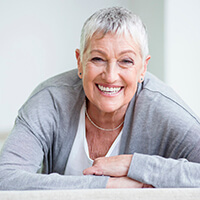 Furthermore, denture wearers who suffer from slipping or loose prosthetics should consider stabilization with dental implants. Enjoy a balanced diet without pain and discomfort when chewing. Speak clearly and succinctly in public. Smile with confidence anytime, anywhere. It all starts with your personal denture consultation.